BURLINGTON, Mass. 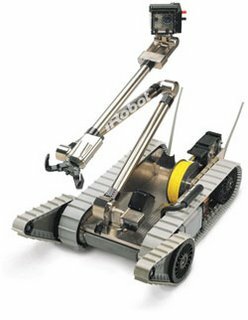 (AP) -- Robot maker IRobot Corp. said Monday it signed a $26 million contract with the Navy to build 213 bomb-disposal robots. Under the contract, the company will build PackBot Man Transportable Robotic System robots, which enable experts to locate and disable bombs from a safe distance. The company has already sold the Navy two orders of PackBot robots worth $17 million, the company said. The U.S. military has requirements for up to 1,200 PackBot robots through 2012, the company said. More than 300 PackBot robots have been deployed worldwide and have performed tens of thousands of missions, the company said.